CALHOUN, John Caldwell, (cousin of John Ewing Colhoun and Joseph Calhoun), a Representative and a Senator from South Carolina and a Vice President of the United States; born near Calhoun Mills, Abbeville District (now Mount Carmel, McCormick County), S.C., March 18, 1782; attended the common schools and private academies; graduated from Yale College in 1804; studied law, admitted to the bar in 1807, and commenced practice in Abbeville, S.C.; also engaged in agricultural pursuits; member, State house of representatives 1808-1809; elected as a Democratic Republican to the Twelfth and to the three succeeding Congresses and served from March 4, 1811, to November 3, 1817, when he resigned; Secretary of War in the Cabinet of President James Monroe 1817-1825; elected vice president of the United States in 1824 with President John Quincy Adams; reelected in 1828 with President Andrew Jackson and served from March 4, 1825, to December 28, 1832, when he resigned, having been elected as a Democratic Republican (later Nullifier) to the United States Senate on December 12, 1832, to fill the vacancy caused by the resignation of Robert Y. Hayne; reelected in 1834 and 1840 and served from December 29, 1832, until his resignation, effective March 3, 1843; Secretary of State in the Cabinet of President John Tyler 1844-1845; again elected to the United States Senate, as a Democrat, to fill the vacancy caused by the resignation of Daniel E. Huger; reelected in 1846 and served from November 26, 1845, until his death in Washington, D.C., March 31, 1850; chairman, Committee on Finance (Twenty-ninth Congress); interment in St. Philip's Churchyard, Charleston, S.C.
Papers: Correspondence in Tait family papers, 1786-1899; Hall family papers, 1785-1923; and Harry Toulmin letters, 1813-1818. Papers: 1 pension paper (July 31, 1819); and 1 letter (April 18, 1848). Papers: Microfiche of 23 political letters (1824-1850) to H.W. Conner, president of Bank of Charleston, original edition held by South Carolina Historical Society; and letters to H.W. Conner about Calhoun in Armistead Burt letters, 1847-1848. Papers: Ca. 30 miscellaneous items in various collections. Papers: Discussed in Abraham Robinson Johnston papers, 1834-1849. Papers: 1784-1888. 6 feet; ca. 3,000 items. Includes correspondence, chiefly with prominent contemporaries, pamphlets, a surveyor's book (1784-1819), portrait, and memorabilia. Index of correspondents. Restricted. Additional Papers: Items in William Hayne Mills papers, 1926-1979; William Pinckney Starke biographical notes, 1733-1978 (bulk 1733-1811); and Alester G. Holmes papers, 1789-1977. Papers: In Frederic Bancroft papers, 1890-1930. Ca. 15,000 items. Includes notes and source material for Bancroft's work on Calhoun. Papers: 1765-1902. 345 items. Family, business, and political correspondence. Also 3 letters (1837-1839) in the Jesse Barton and John R. Mulvany papers, 1825-1903. Finding aid. Papers: 1821, 1823. 2 letters. Also several letters to Calhoun and references in various collections. Papers: Items in the James Moore Swank papers, 1785-1898; Willam W. Porter papers, 1770-1880; Joel Roberts Poinsett papers, 1785-1851; Deborah Norris Logan diaries, 1815-1839; Daniel Parker papers, 1800-1846; Gilpin family papers, 1727-1872; Lewis S. Coryell correspondence, 1806-1867; Roberdeau Buchanan collection, 1761-1831; Hopkinson family papers, 1735-1863; and Charles Jared Ingersoll papers, 1803-1862. Papers: 1 Revolutionary claim (1819) in the Thomas C. Bright autograph collection. Finding aid. Papers: 1 notification of appointment to U.S. Military Academy (February 21, 1825) in Seymour autograph collection, 1750-1945; and correspondence in George Bancroft papers, 1819-1889. Finding aid. Papers: 1819-1850. 1 container; 66 items. In part, photocopies and transcripts. Correspondence (1819-1849) with John R. Mathews and Littleton W. Tazewell, manuscript of last Senate speech (March 5, 1850), and list of rules (1828) for the U.S. Commissioner of Public Buildings. Also a microfilm edition on 6 reels that includes Calhoun material in other Library of Congress collections. Additional Papers: Correspondence in William Wirt papers, 1802-1858; Riggs family papers, 1763-1945; Andrew and John White Stevenson papers, 1756-1882; and in Roger Jones papers, 1816-1869, (part of Peter Force papers). Papers: Ca. 100 items (1813-1850) in various collections. Papers: Mentioned in Caleb Goldsmith Forshey papers, 1838-1879. Papers: 13 letters (1823-1836) in the Samuel L. Gouverneur papers. Finding aid. Papers: Items in Henry Post papers, 1807-1846 (bulk 1807-1828); Harmanus Bleeker papers, 1801-1885; Autographs of American authors and statesmen collection ca. 1770-1865; and 4 letters (January 31, 1821; April 15, 1822; October 14, 1822; September 24, 1824). Papers: 26 items (1816-1845); and 1 document (May 20, 1818) and 7 letters (1818-1848) on various topics in the Gilder Lehrman collection. Finding aid. Papers: 1831. 2 letters. From Samuel Southard. Papers: Represented in Miscellaneous Manuscripts, Series I and II, 1631-1979, and Prioleau family autograph collection, 1697-1876. Papers: 74 items (1816-1843) in several collections, including the Van Deveuter, Brown, and Cass collections. Finding aid. Papers: 17 items (copies) in Joseph W. Lesesne papers, 1833-1848. Includes 4 letters from Calhoun discussing elections and current issues. Papers: 2 letters by and 1 to Calhoun (1822-1823) in various collections. Finding aid. Papers: 1743-1977. 3,241 items. Family, political and business correspondence. Papers: In Richard Kenner Cralle1 papers, 1829-1860. Ca. 200 items. Includes an account of politics (ca. 1820-1840s) centering around Calhoun and correspondence (1853-1858) concerning The Works of John C. Calhoun, edited by Cralle1. Papers: Numerous items in various collections including the Harrison family papers, 1756-1893; the Wise family papers, 1777-1973; available on microfilm; and the Hunter family papers, 1766-1918, available on microfilm. Papers: In the Robert Mercer Taliaferro Hunter papers, 1820-1860, 1876; Washington and Lee University manuscript collection, 1777-1869; and Johnston family papers, 1779-1891. Papers: Correspondence in the F.W. Pickins papers, 1826-1869. Papers: Items in John McLean papers, 1817-1861, on 18 microfilm reels, originals at the Library of Congress; David Daggett papers, 1781-1851; Morse family papers, 1778-1868; Abraham Sands papers, 1808-1830; Benajah Ticknor papers, 1818-1852, available on 3 microfilm reels; Silliman family papers, 1717-1977 (bulk 1717-1911); and several autograph collections. Research Libraries Information Network In addition to the institutions listed above, items are also cataloged in collections at: American Philosophical Society, Philadelphia, PA; Brigham Young University, Provo, UT; Cornell University Libraries, Ithaca, NY; Dartmouth College, Hanover, NH; Emory University, Atlanta, GA; Hagley Museum and Library, Greenville, DE; Historic New Orleans Collection, New Orleans, LA; New York University Libraries, New York, NY; Pennsylvania Historical and Museum Commission, Harrisburg, PA; Rosenbach Museum and Library, Philadelphia, PA; Smithsonian Institution, Archives of American Art, Washington, DC; Stanford University Libraries, Stanford, CA; Vassar College Library, Poughkeepsie, NY; Winterthur Museum, Winterthur, DE; and others. Ames, Herman V. John C. Calhoun and the Secession Movement of 1850. 1918. Reprint. Freeport, NY: Books for Libraries Press, 1971. Originally published in Proceedings of the American Antiquarian Society for April, 1918. Anderson, James L., and W. Edwin Hemphill. "The 1843 Biography of John C. Calhoun: Was R.M.T. Hunter Its Author?" Journal of Southern History 38 (August 1972): 469-74. Anderson, John M., ed. Calhoun: Basic Documents. State College, PA: Bald Eagle Press, 1952. Atwell, Priscilla Ann. "Freedom and Diversity: Continuity in the Political Tradition of Thomas Jefferson and John C. Calhoun." Ph.D. dissertation, University of California, Los Angeles, 1967. Bancroft, Frederic. Calhoun and the South Carolina Nullification Movement. 1928. Reprint. Gloucester, MA: P. Smith, 1966. Bartlett, Irving J. John C. Calhoun: A Biography. New York: W.W. Norton Co., 1993. Bates, Mary. The Private Life of John C. Calhoun. Charleston, SC: Walker, Richards Co., 1852. Boller, Paul F., Jr. "Calhoun on Liberty." South Atlantic Quarterly 66 (Summer 1967): 395-408. Boucher, Chauncy S., and Robert Preston Brooks, eds. "Correspondence Addressed to John C. Calhoun, 1837-1849." In Annual Report of the American Historical Association for the Year 1929, vol. 2, pp. 125-570. Washington: Government Printing Office, 1930. Brasington, George F. "Jackson, Calhoun, and State Rights." Emory University Quarterly 15 (October 1959): 168-75. Brown, James Donnell. "Rhetorical Fantasy in the Webster-Calhoun Debate on the Revenue Collection Bill of 1833." Ph.D. dissertation, University of Minnesota, 1977. Bundy, Judy. "John C. Calhoun's Reflections on 'Federalist' No. Ten: The Concurrent Majority as a Foundation for American Pluralist Theory." Ph.D. dissertation, University of Houston, 1987. Calhoun, John C. [R.M.T.Hunter, presumed author]. Life of John C. Calhoun, Presenting a Condensed History of Political Events from 1811 to 1843. New York: Harper Brothers, 1843. Capers, Gerald M. John C. Calhoun, Opportunist: A Reappraisal. Gainesville: University of Florida Press, 1960. ___. "A Reconsideration of John C. Calhoun's Transition from Nationalism to Nullification." Journal of Southern History 14 (February-November 1948): 34-48. Reprinted in Thomas, John C. Calhoun: A Profile. Cheek, H. Lee, Jr. Calhoun and Popular Rule: The Political Theory of the Disquisition and Discourse. Columbia: University of Missouri Press, 2001. ___. "Calhoun and His Critics." Telos 118 (Winter 2000): 59-76. ___, ed. John C. Calhoun: Selected Writings and Speeches. Lanham, Md. : Nationa.l Book Network, 2003. Clarke, James D. "Calhoun and the Concept of 'Reactionary Enlightenment': An Examination of the Disquisition on Government." Ph.D. dissertation, University of Keele, 1982. 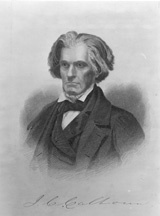 Coit, Margaret L. John C. Calhoun: American Portrait. 1950. Reprint, with new introduction by Clyde N. Wilson. Columbia: University of South Carolina Press, 1991. ___, ed. John C. Calhoun. Englewood Cliffs, NJ: Prentice-Hall, 1970. Crall, Richard K., ed. The Works of John C. Calhoun. 6 vols. 1851-1856. Reprint. New York: Russell Russell, 1968. Calhoun's A Disquisition on Government and A Discourse on the Constitution of the United States are reprinted in vol. 1. Current, Richard N. John C. Calhoun. New York: Washington Square Press, 1963. ___. "John C. Calhoun, Philosopher of Reaction." Antioch Review 3 (Summer 1943): 223-34. Reprinted in Thomas, John C. Calhoun: A Profile. Dillenbeck, Bruce L. "The Decade After Moses: The Political Legacy of John C. Calhoun." Ph.D. dissertation, Florida State University, 1990. Dodd, William E. "John C. Calhoun." In Statesmen of the Old South; or, From Radicalism to Conservative Revolt, pp. 91-167. New York: Macmillan Co., 1911. Donoghue, Francis John. "The Economic and Social Policies of John C. Calhoun." Ph.D. dissertation, Columbia University, 1969. Drucker, Peter F. "A Key to American Politics: Calhoun's Pluralism." Review of Politics 10 (1948): 412-26. Reprinted in Thomas, John C. Calhoun: A Profile. ___. "John C. Calhoun's Land Policy of Cession." South Carolina Historical Magazine 55 (October 1954): 198-209. Erickson, David F. "John C. Calhoun, South Carolina, and the Union." In The Shaping of American Liberalism: The Debates Over Ratification, Nullification, and Slavery, pp. 75-89. Chicago: University of Chicago Press, 1993. Ewing, Gretchen Garst. "Duff Green, John C. Calhoun, and the Election of 1828." South Carolina Historical Magazine 79 (April 1978): 126-37. Ford, Lacy K., Jr. "Inventing the Concurrent Majority: Madison, Calhoun, and the Problem of Majoritarianism in American Thought." Journal of Southern History 60 (February 1994): 19-58. ___. "Republican Ideology in a Slave Society: The Political Economy of John C. Calhoun." Journal of Southern History 54 (August 1988): 405-24. Foster, Thomas, and George Cochran, comps. Eulogies Delivered in the Senate and House of Representatives of the United States on the Life and Character of Hon. John C. Calhoun, of South Carolina, Hon. Henry Clay, of Kentucky, and Hon. Daniel Webster, of Massachusetts. Washington: Foster Cochran, 1853. Freehling, William W. "Spoilsmen and Interests in the Thought and Career of John C. Calhoun." Journal of American History 52 (July 1965): 25-42. Reprinted in Thomas, John C. Calhoun: A Profile. Garson, Robert A. "Proslavery as Political Theory: The Examples of John C. Calhoun and George Fitzhugh." South Atlantic Quarterly 84 (Spring 1985): 197-212. Harp, Gillis J. "Taylor, Calhoun, and the Decline of a Theory of Political Disharmony." Journal of the History of Ideas 46 (January-March 1985): 107-20. Harris, J. William. "Last of the Classical Republicans: An Interpretation of John C. Calhoun." Civil War History 30 (September 1984): 255-67. Harrison, Lowell H. " 'A Cast-Iron Man': John C. Calhoun." American History Illustrated 9 (February 1975): 4-9, 43-49. Heckscher, Gunnar. "Calhoun's Idea of 'Concurrent Majority' and the Constitutional Theory of Hegel." American Political Science Review 33 (August 1939): 585-90. Hill, C. William. "Contrasting Themes in the Political Theories of Jefferson, Calhoun, and John Taylor of Caroline." Publius 6 (Summer 1976): 73-91. Hizer, Trenton E. "John C. Calhoun's Early Nationalism." Master's thesis, University of South Carolina, 1990. Hofstadter, Richard. "John C. Calhoun: The Marx of the Master Class." In The American Political Tradition and the Men Who Made It, pp. 86-117. 1948. Reprint. New York: Alfred A. Knopf, 1973. Holst, Hermann E. von. John C. Calhoun. 1882. Reprint with new introduction by Clyde N. Wilson. New York: Chelsea House, 1980. Hunt, Gaillard. John C. Calhoun. Philadelphia: G.W. Jacobs Co., 1908. Jameson, J. Franklin, ed. "Correspondence of John C. Calhoun." In Annual Report of the American Historical Association for the Year 1899, vol. 2. Washington: Government Printing Office, 1900. Jeffrey, Robert Campbell, Jr. "The Thought of John C. Calhoun: The Key to the Liberal Critique of American Politics." Ph.D. dissertation, University of Dallas, 1985. Jenkins, John Stilwell. The Life of John Caldwell Calhoun. Auburn, NY: J.M. Alden, 1850. Kateb, George. "The Majority Principle: Calhoun and His Antecedents." Political Science Quarterly 84 (December 1969): 583-605. Lander, Ernest McPherson, Jr. "The Calhoun-Preston Feud, 1836-1842." South Carolina Historical Magazine 59 (January 1958): 24-37. ___. Reluctant Imperialists: Calhoun, the South Carolinians, and the Mexican War. Baton Rouge: Louisiana State University Press, 1980. Lence, Ross M., ed. Union and Liberty: The Political Philosophy of John C. Calhoun. Indianapolis: Liberty Fund, 1992. Lerner, Ralph. "Calhoun's New Science of Politics." American Political Science Review 57 (December 1963): 918-32. Reprinted in Thomas, John C. Calhoun: A Profile. Maier, Pauline. "The Road Not Taken: Nullification, John C. Calhoun, and the Revolutionary Tradition in South Carolina." South Carolina Historical Magazine 82 (January 1981): 1-19. Marmor, Theodore R. "Anti-Industrialism and the Old South: The Agrarian Perspective of John C. Calhoun." Comparative Studies in Society and History 9 (July 1967): 377-406. ___. The Career of John C. Calhoun: Politician, Social Critic, Political Philosopher. New York: Garland Publishing, 1988. Meigs, William Montgomery. The Life of John Caldwell Calhoun. 2 vols. 1917. Reprint. New York: Da Capo Press, 1970. Meriwether, Robert M., W. Edwin Hemphill, Clyde N. Wilson, Shirley Bright Cook, et al., eds. The Papers of John C. Calhoun. 28 vols. to date. Columbia: University of South Carolina Press, 1959-. Moore, Frederick W., ed. "Calhoun as Seen by His Political Friends: Letters of Duff Green, Dixon H. Lewis, Richard K. Cralle1 During the Period from 1831 to 1848." Publications of the Southern History Association 7 (May 1903): 159-69; (July 1903): 269-91; (September 1903): 353-61; (November 1903): 419-26. Ogburn, Charlton. "The Constitutional Principles of John C. Calhoun." Journal of Public Law 2 (Fall 1953): 303-13. Pinckney, Gustavus M. Life of John C. Calhoun. Charleston, SC: Walker, Evans Cogswell, 1903. Putterman, Theodore L. "Calhoun's Realism?" History of Political Thought 12 (Spring 1991): 107-24. Read, James H. Majority Rule Versus Consensus: The Political Thought of John C. Calhoun. Lawrence: University Press of Kansas, 2009. Rice, Daryl H. "John C. Calhoun." History of Political Thought 12 (Summer 1991): 317-28. Riven, Audrey A. "John Taylor, John C. Calhoun, and Roger B. Taney: The Three Views of States Rights." Master's thesis, Vanderbilt University, 1960. Silbey, Joel H. "John C. Calhoun and the Limits of Southern Congressional Unity, 1841-1850." Historian 30 (November 1967): 58-71. Spain, August O. The Political Theory of John C. Calhoun. 1951. Reprint. New York: Octagon Books, 1968. Styron, Arthur. The Cast-Iron Man: John C. Calhoun and American Democracy. New York: Longmans, Green Co., 1935. Swan, Giles J. "The Political Philosophy of John C. Calhoun." Ph.D. dissertation, New York University, 1909. Thatcher, Harold W. "American Government and Politics: Calhoun and Federal Reinforcement of State Laws." American Political Science Review 36 (October 1942): 873-80. Thomas, John L., comp. John C. Calhoun: A Profile. New York: Hill Wang, 1968. U.S. Congress. Senate. Obituary Addresses Delivered on the Occasion of the Death of the Hon. John C. Calhoun, a Senator from South Carolina, in the Senate of the United States, April 1, 1850. 31st Cong., 1st sess., 1849-1850. Washington: J.T. Towers, 1850. Volpe, Michael. "The Logic of Calhoun's Constitutional Theory." Southern Speech Communication Journal 39 (Winter 1973): 161-72. Walker, Mary Meade. "Problems of Majority Rule in the Political Thought of James Madison and John C. Calhoun." Ph.D. dissertation, Indiana University, 1971. Walmsley, James. "The Return of John C. Calhoun to the Senate in 1845." In Annual Report of the American Historical Association for the Year 1913, vol. 1, pp. 159-65. Washington: Government Printing Office, 1915. Wilson, Clyde N. John C. Calhoun: A Bibliography. Westport, CT: Meckler, 1990. ___, ed. The Essential Calhoun. New Brunswick, NJ: Transaction Publishers, 1991. Wiltse, Charles M. "Calhoun: An Interpretation." Proceedings of the South Carolina Historical Association (1948): 26-38. ___. "Calhoun's Democracy." Journal of Politics 3 (May 1941): 210-23. ___. "Calhoun and the Modern State." Virginia Quarterly Review 13 (Summer 1937): 396-408. ___. "A Critical Southerner: John C. Calhoun on the Revolutions of 1848." Journal of Southern History 15 (August 1949): 299-310. ___. John C. Calhoun. 3 vols. 1944-1951. Reprint. New York: Russell Russell, 1968. Woods, John A. "The Political Philosophy of John C. Calhoun." Ph.D. dissertation, University of Rochester, 1953.